The Archbishop of Canterbury has urged the people of Britain to rediscover the original “story of the universe” as told in the King James Bible in their bid to understand their place in society. This, he says, will enable them to put their own lives into a wider perspective and to apply some old solutions to modern day problems. The archbishop said that the bible provides other tools for helping families struggling with the harsh economic and employment times. The archbishop said that there are other areas in which the church and the Bible should be taken seriously as it is as relevant today as it was when man was slowly mastering iron as a tool and believed that the Earth was the centre of the universe. 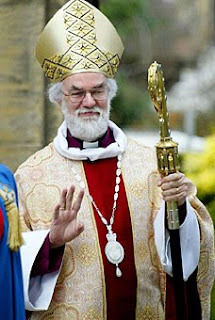 In other budgetary matters the Archbishop said that the welfare cutbacks proposed by the coalition government were also in line with God’s teaching. Dr Williams said that leaving economics aside, the Bible was incredibly relevant to today’s modern societal and family structures.